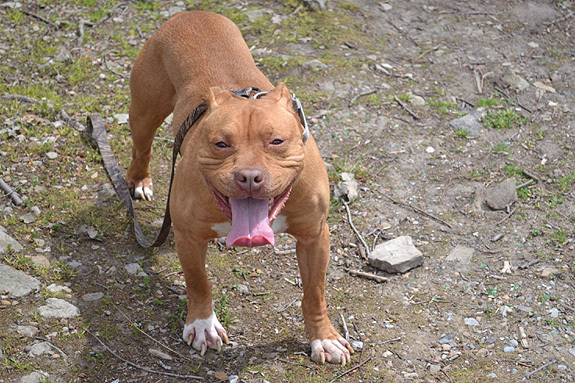 We have had our pit bull Jack since he was a puppy, and he had terrible demodectic. This was before we had kids, and we only had one other little dog. Jack has always seemed a little sad, and we think it had to do with all the sickness he had as a puppy. He missed out on a lot of puppy things because he had no hair and was covered in scabs. We got it taken care of for him, but shortly after, we found out we were expecting twins! We spent a few months trying to socialize Jack, train him and otherwise have him ready to be around little ones. While I was pregnant, Jack used to lay his head on my lap and watch my belly. He was protective from the start! 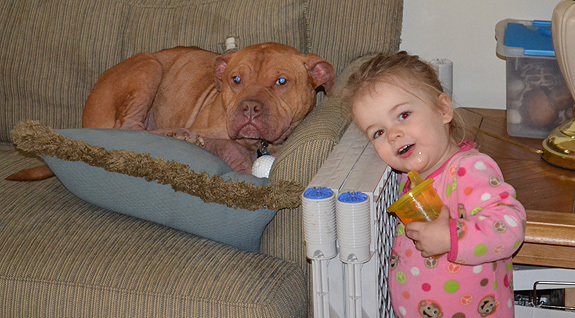 When our kids were first born, they were extremely tiny little babes, so mostly we kept the dogs in separate rooms. They also had some breathing problems, and we didn’t want to encourage any allergies, just in case. As our kids grew, they started noticing our fur babies. Both of my kids’ first word was “JACK!” When they were less than a year old, they could say, “Hi Gak! !” This was before “Mama” or “Dada.” Imagine how we felt! But it didn’t surprise us: Jack wanted nothing more than to snuggle up with those two babies! Jack doesn’t realize what a big guy he is, so his tail knocks the kids over, and he sometimes doesn’t realize he’s stepping on people! Scarlett and Nathan always forgive him, though. And I’m pretty sure Scarlett would wrestle with Jack if we let her. She lays all over him, kisses his face, and wraps her arms around his neck. He just licks her face and smells her sticky toddler clothes! They really are the best of friends, Scarlett and Jack. Nathan is a little more afraid of Jack, but I think he’s been knocked over just a few more times than Scarlett has, so I understand (and I’m sure Jack does too!). We couldn’t ask for better kids or a better dog! Jack looks like a big tough guy, but really he’s just like another toddler in our house, making messes and giving kisses! How sweet. I laughed out loud at the thought of Jack knocking them over with a wag of his tail! I’m sure they’ll appreciate him more and more as they get older. The only dangerous part of Herman was his tail. 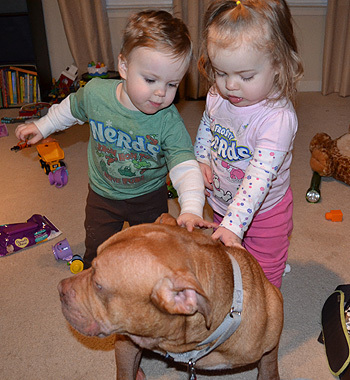 When Herman first adopted us, he and a neighbor’s 3 year old son became fast friends, so we’ve been there. Thanks for Sharing! 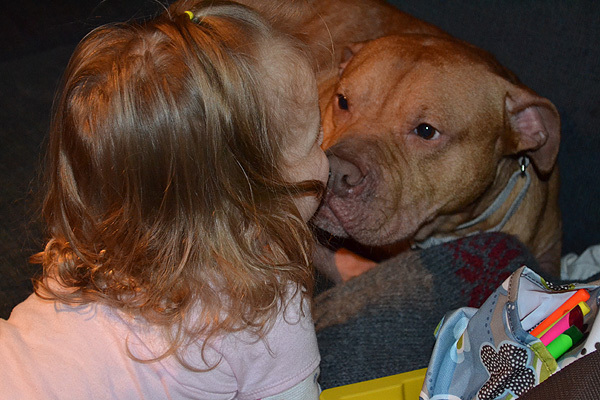 I Love Pittie and Kiddie stories!